As February speeds by, I’m a few weeks into teaching my first full-length class: Spirituality, Science, and the Creative Process at Otis College of Art and Design. I’m blessed with a tight group of intelligent, engaged students, so I’m having a great time. And interweaving art and creativity into my poetic interconnections between spirituality and science is revealing itself to be an inspiring exercise. My mind fairly quickly derailed. I thought immediately about p’u—the Taoist ideal of the uncarved block. In Chinese philosophy, our most natural state of being is simple and undefined. Before experiences and judgments introduce distinctions such as good/bad, right/wrong, and even me/you into our thinking, we all enter the world as blank canvases. We have no fixed mental forms and thus infinite potential for becoming. This state of being is highly desirable, as it mimics the tao—the sacred Way of the universe. So in Taoism, p’u is the goal of life. About.com describes this ideal beautifully as “perception without prejudice”. Physics describes a similar condition, calling it symmetry. An oft-cited example of this is a pencil balanced on its tip. For the briefest of instants, the pencil has no preferred direction for falling. Its possibilities are equal, therefore symmetrical. But as soon as the pencil tips one way or the other its symmetry is broken. Infinite potential yields one actualized outcome. It’s both a triumph and a tragedy. Physicists believe that right after the Big Bang our earliest universe was highly symmetrical: matter, light, and the fundamental forces (gravity, electromagnetism, etc.) were indistinguishable. Only with time did differentiation enter our universe, as the energy from its explosive birth calmed and cooled and light clarified from dust, matter decoupled from force. Our universe, too, began as a blank canvas. Michelangelo made a miracle: he actualized the potential in the marble, breaking its symmetry in an act of loving creation. A Western mystic might say he imitated God. I believe creative artists channel divinity every time they sit to work. I’m teaching this idea in class. In doing so, though, I realize I’m betraying some of my source material. Eastern spiritual traditions believe differentiated creation is illusory and a source of suffering, advocating a return to a state of unrealized potential so pure it precludes rebirth into the world. 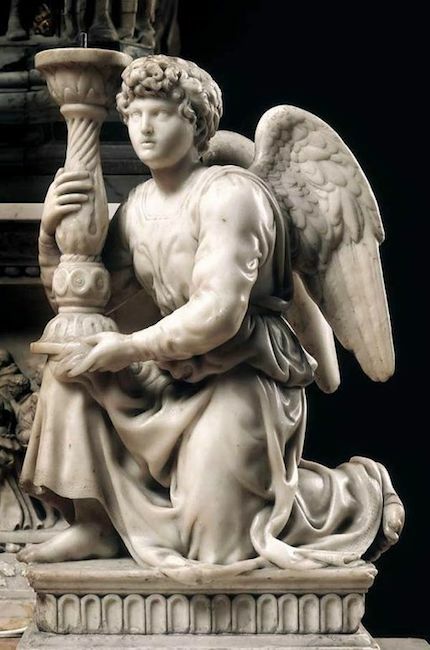 And so an interesting question presents itself: Is God the slab of marble or the angel Michelangelo revealed inside? Is divinity the Taoist uncarved block or the forms we recognize as ourselves? Is our ideal condition perfectly symmetrical or the broken symmetry necessary for creation?